The dual band Wilson cellular amplifiers on this page will work with all U.S. systems except Nextel/Mike. We recommend one of the dual band mobile amps below if you travel to different areas. Cingular, Sprint and T Mobile mostly use GSM/PCS 1900MHz system. Their are some exceptions, mostly in rural areas where the 800MHz band is used. The Dual Band repeaters below will cover both bands allowing maximum coverage. The new Wilson repeater "SMART" cell phone amplifier features indicator lights that tell you if the equipment is installed and functioning correctly. They also regulate the power of the wireless amp to keep it from oscillating between the inside & outside antenna. If the two antennas are too close together they will effectively cancel each other out. The inside and outside antennas should be 40'+ apart for the 50Db, 75'+ for the 60Db in-building amplifiers. The amplifier can be placed anywhere in between. 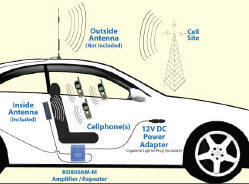 For mobile amplifiers the metal roof of the vehicle separates the two antennas. Smart amps also automatically adjust the amp power output to prevent the cell phone booster from overdriving the cell tower when close by. Overdriving can cause the cell towers to drop signals. Wilson Cellular phone booster, wireless repeater amplifier and antennas are top of the line equipment. When a Wilson Electronics cellular repeater amplifier and cellular antenna are used together they can boost a cell phone signal from 0 to 6 bars which can easily increase the range to fifty miles or more on flat land virtually eliminating signal drop out. Wired (Direct Connect) or wireless cellular amplifier's are available. The Wilson 12" magnet mount cellular antenna is recommended for cars, SUV's and pick ups. The Wilson no ground Trucker cellular antenna works well on 18 wheelers, motor homes, boats and buildings. The Wilson Yagi directional cellular antenna is recommended for in-building use. Special Wilson cellular booster amps and Wilson cellular antennas are available for Nextel cellular customers. Nextel has their own cellular band on 800MHz. Wilson has designed cellular amplifiers and cellular antennas that are tuned specifically for Nextel cell phones. Cellular Phone Equipment and Accessories.